Wonder why they keep coloring sheets and stuff for the kids at most eating joints? It keeps them busy…distracted…a break for the parents…oh, what a relief!! Most kids seems to enjoy. All ages, all stages. You can often see them scribbling away! 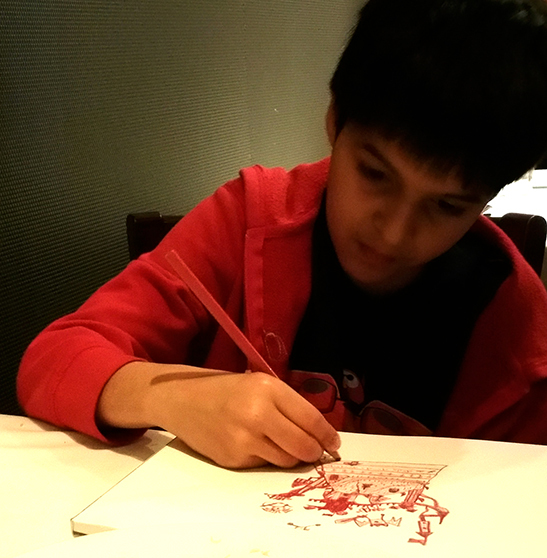 Sometimes when Tejjas carries his sketchbook along, there is a different air around him! He feels happier, content and in command. Maybe it’s just a nice co-incidence. Maybe it’s the imaginary world in his head that keeps him occupied and he forgets to get ‘bored’. Maybe it’s just the good old magic of art!! Do your let your kids carry their art around? Maybe try it this weekend! !